Sanskar and ragini’s eyelock breaks by the anoucement…..
Everyone hoots for them….swara blushes…. Laksh- so guys lets enjoy……..lets start with dance…hey dj play some song…guys come lets rock on the dance floor……..
Laksh takes swara with him…….sonal also goes with her boyfriend……….a girl comes to sanskar and asks him to dance with her…..sanskar grees……….ragini looks at him……sanskar smirks……..
Ragini looks at sanskar who is looking at her ………ragini smirks……. All the couples start dancing…….. The boy holds ragini’s waist……and pulls her towars him……..ragini feels uncomfortable……..but smiles back….seeing sanskar staring them………..
As the boy knows who sanskar maheswari is….leaves from there immediately…….ragini looks at sanskar with love in her eyes…..
Ragini-so do you agree that you still cants see me with anyone……. Sanskar- you are mistaken…miss Gadodia….i did this just because the boy was not good……he was looking at you lustfully. Ragini- so why do you care mr maheswari…. Ragini- mr sanskar maheswari……you still love me…..you still care for me……..you believe it or not……but your heart knows it………in deep in your heart……you still love me sanskar…..
Sanskar looks at her……and pushes her slightly……..ragini looks at him……. Sanskar holds her hand……and pulls her to him……and starts dancing………they are lost in each othr while dancing……..
Ragini moves away from him……..
Sanskar ccomes to bar……and takes a full botlle of wine…and goes from there………ragini looks on……..
Ragini is about to follow him…but swara takes her with her…..
After sometime ragini makes some excuse and goes out in search of sanskar……..
Ragini- sanskar…..sanskar where are you…. Ragini- sanskar you are drunk……. 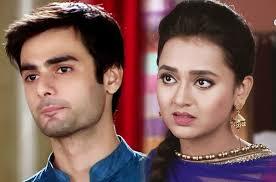 Sanskar- ragini………I really…..really love you a lot……why did you do this to me………..i really loved you…..but you……. Saying this he starts coming near her…….he holds her face…….and comes near her to capture her lips….ragini closes her eyes…….. But sanskar instead hugs her……ragini opens her eyes…..and hugs him back……..
Ragini smiles listening to him……..
Ragini looks at him shocked…. Sanskar- go away from me………you are betrayer……….a big betrayer……….you broke my heart……….why ragini……..
Ragini runs after him……and hugs him from behind……..but sanskar jerks her……. Sahurya- I said na…..go.just go……..
Ragini runs to save sanskar……..she pushes sanskar……..and they both falls on the side of the road……. They bring first aid….and puts bandaid on her forehear and bandages her hand……..
Swara- yeah Laksh ragini di is saying right…. Laksh aagrees …………they take sanskar to Gadodia house…..
Ragini asks laksh to stay at her room with sanskar…. Ragini sonal and swara………sleeps at swara’s room…..
Mornining…………laksh leaves from their early morning………swara tells to family whatever happened yesterday……. Sanskar was still sleeping……….ragini comes to her room to freshen up………she looks at sanskar who is sleeping……..
She comes near him…and kisses at his forehead……..
Sanskar waked up….and sees ragini so close to him……..they both share an eyelock………. Sanskar- so ragini Gadodia…….i didn’t thought you will stoop so low……..you are trying to seduce me……..so that you can trap me again……and then get married to me………. Sanskar- oo please stop you nonsesnse…….i know you very well what were you doing now……..
Ragini looks at him in disbelief…. Ragini cries….sanskar looks at her from back……….and sliently leaves from there…. Ragini breaks down and cries…..
Sanskar- ragini why did you came back in my life again…….however I try to the you………but you said right…….in deep in my heart I still love you ragini………after swalak’s marriage I will leave from here…………I wish I would not see you face ever in my life…..
That day ragini got ready for valentines day party….. While ragini and sonal reached the ransom palace…. Ragini parked the car and was about to go…when she notices a guy sitting in the park singing holding his guitar…. Sonal- what urgent work ragini…. Ragini- I said na go please……..
Sonal knows how stubborn ragini is…..so she leaves from there……..
Ragini moves towards the park and sees the boy from backside……..
Ragini looks at him and slowly moves towards him…. Hai kyu faasle darmiyaan leke aaye re …. Kaanch ke who… khwaab naazuk thhe humare saare..
Chhune se hi tuttne lage…. Na marna munasib jiya bhi na jaaye re …. Ragini understands he is in pain…his song is full of pain….but still his voice is heart touching…. Ragini comes infront of him……..and the boy is revealed to be sanskar….